the theoretical assumptions underpinning gestalt therapygestalt assessment and process diagnosis field theory, phenomenology and dialogueethics and valuesevaluation and research. "Mann shows a wealth of specialist knowledge, communicated clearly, and takes the reader on a therapeutic journey into the world of Gestalt. I recommend this book to all practitioners, students and professionals, as well as to clients wishing to review the journey they have made with their therapist." - Terry Browning, Gestalt Counsellor, London & Member of the British Association for Counselling and Psychotherapy. "Whether you are familiar with Gestalt Theory, or just starting out, this book is a must. 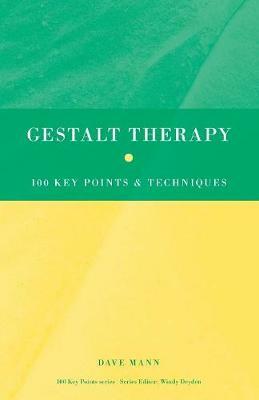 Mann has successfully undertaken the task of outlining key concepts in Gestalt Theory and has provided a benchmark to work from. Do not consider borrowing this book, you must buy it! You will keep dipping into it for references, definitions, ideas and examples. "- Dr Sally Denham -Vaughan, UKCP Registered Gestalt Psychotherapist, Trainer, Supervisor and Writer. "I wish this book had been available when I was beginning to learn about therapy. I treasure the sophisticated humanity, grace and flexibility that gestalt therapy embodies and yet its theory can be difficult to grasp. Mann, writing in his conversational style, draws the reader into gentle conversation with a wise elder who makes gestalt therapy accessible without reducing its wisdom." - Lynne Jacobs, Ph.D., Co-Founder, Pacific Gestalt Institute, Los Angeles, CA, USA.